The cupcakes were pretty straight forward. Make white cake batter, divide into 3 parts, and tint 2 of them yellow and orange. I just spooned a little of each color into the paper cups. Next time I'll have to try something different to keep the layers of color straight in there. The top layer of white kind of sunk down in there. 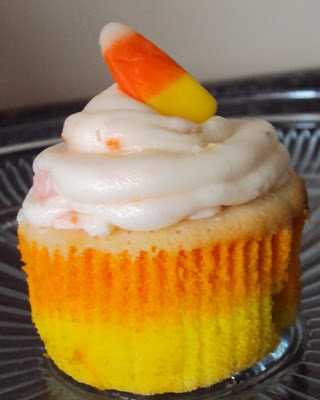 I used candy corn with some leftover homeade buttercream I already had "laying" around. It's pretty straightforward. 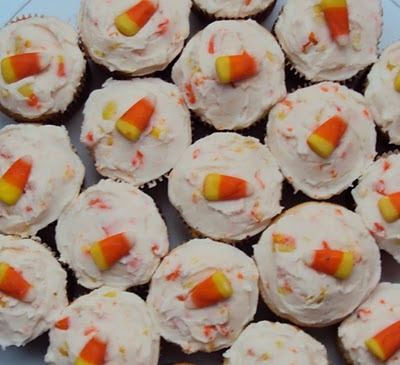 Have buttercream, add candy. The end. 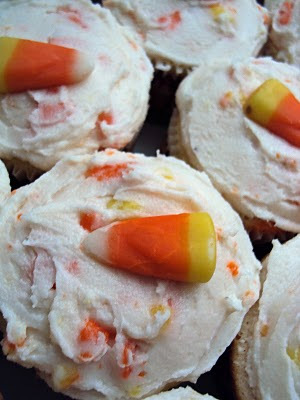 Hmmmm, what other kinds of candy can I make cupcakes out of? ?